The paper addresses the problem of measuring whole-body dynamics for a multiple-branch kinematic chain in presence of unknown external wrenches. The main result of the paper is to give a methodology for computing whole body dynamics by aligning a model of the system dynamics with the measurements coming from the available sensors. Three primary sources of information are exploited: (1) embedded force/torque sensors, (2) embedded inertial sensors, (3) distributed tactile sensors (i.e. artificial skin). In order to cope with external wrenches applied at continuously changing locations, we model the kinematic chain with a graph which dynamically adapts to the contact locations. Classical pre-order and post-order traversals of this dynamically evolving graph allow computing whole-body dynamics and estimate external wrenches. Theoretical results have been implemented in an open-source software library (iDyn) released under the iCub project. 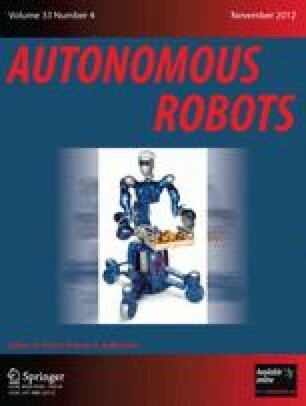 Experimental results on the iCub humanoid robot show the effectiveness of the proposed approach. M. Fumagalli and S. Ivaldi equally contributed to this work. The authors wish to thank Dr. Ugo Pattacini for the iKin software library, upon which iDyn was built. The authors acknowledge the support for the CHRIS, ITALK, Viactors and Roboskin Projects provided by the European Commission grant agreement number FP7-ICT-215805, FP7-ICT-214668, FP7-ICT-231554, FP7/2007-2013 No. 231500.
iCub Project, T. (2011). Documentation of icub kinematics. http://eris.liralab.it/wiki/ICubForwardKinematics. Ivaldi, S., Fumagalli, M., & Pattacini, U. (2011). Doxygen documentation of the iDyn library. http://eris.liralab.it/iCub/main/dox/html/group__iDyn.html. Pattacini, U. (2011). Doxygen documentation of the iKyn library. http://eris.liralab.it/iCub/main/dox/html/group__iKin.html. Roboskin, E. P. I. F. (2010). http://www.roboskin.eu. Xsens (2012). The MTx orientation tracker user manual. http://www.xsens.com/en/general/mtx.